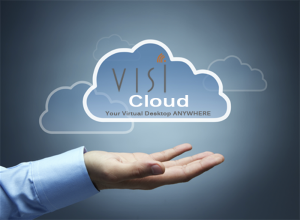 Let VISI bring you to the cloud! Rapidly changing technology often leaves small and medium sized businesses (SMBs) struggling to stay on top. Deploying desktop computers is not an easy task, and can be very time consuming. More SMBs are turning to desktop virtualization as a means to provide computing to their workforce while keeping costs down, particularly in a tough economy where having a full-time IT staff is a luxury. That’s where VISI can help! Secure, mobile access to applications. Virtualized desktops allow employees to access even high-performance applications running the virtual desktop on a high performance machine in the cloud. Flexibility. Using desktop virtualization allows enterprises to provision just a few types of desktops to its users, because virtual desktops can be brought on so quickly, it’s easier for the company to onboard new hires. Desktop Security.A common problem that most SMBs face is employees downloading software or other potentially risky items (like links to funny videos – and malware). Desktop virtualization allows the administrator to set permissions, preventing documents carrying Trojan horses from residing on the system. Reduced Costs. All of these benefits end up at the same place: reduced costs for the business. Because the software licensing requirements are smaller, there are cost savings on applications alone. SMBs also save money with major support issues like removing malware. The rise of cloud computing has enabled companies to forget the traditional machine-based IT model and create virtual desktops, which do not require individual maintenance. These are just a few benefits of moving to the cloud.